Dual radio 2x2 2-stream 802.11a/b/g/n/ac Access Point. Includes 4 Dual Band Omnidirectional Antennas - 2.4 GHz (4 dBi) and 5 GHz (6 dBi). Can be mounted horizontally (below the ceiling) and vertically (on a wall). Includes mounting bracket and screws. Additional Mounting brackets optional. Dual-radio 2x2 2-stream 802.11a/b/g/n/ac Access Point with integrated antennas. Can be mounted horizontally (below the ceiling) and vertically (on a wall). Includes mounting bracket and screws. Additional Mounting brackets optional. 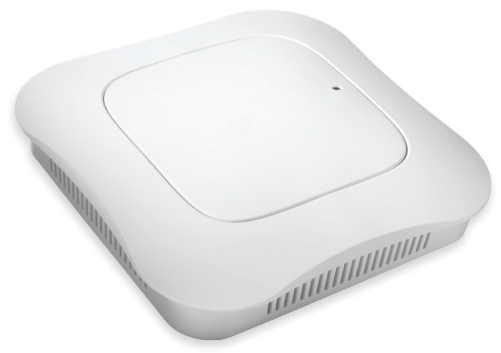 Fortinet AP series Access Points (APs) provide a high-performance, premise-managed WiFi network with a broad range of 802.11ac Wave 1 and Wave 2 APs that ease deployment and scaling and offer a number of compelling quality-of-experience advantages. They also provide a complete portfolio of security services that offer additional means of protection to combat the ever-evolving threat landscape. Fortinet also offers an RF technology that uniquely manages the spectrum utilization, allowing it to dramatically simplify deployment vs competing solutions. Provides administrators with Application Visibility to prioritize applications to improve the user experience by guaranteeing more capacity to select groups, such as mission-critical applications or mobile point-of-sale (mPoS) devices. Provides sophisticated air traffic control mechanisms to govern station airtime so every client gets a fair turn on-air, which prevents the slowest, or the fastest, devices from hogging resources. Unique technology that manages spectrum utilization to overcome the interference-related deployment barriers commonly encountered in high density environments. The AP822 catalyzes the migration to Gigabit WiFi by bringing the power of enterprise-wide, full channel 802.11ac to more customers. The AP822 is a cost-effective solution designed to meet the mid-range performance requirements of offices, schools, universities, hospitals, hotels, and retail stores, and it supports up to an aggregate 1.17 Gbps data rate for the most demanding business applications such as video and voice. The AP822 is positioned to accelerate the adoption of 802.11ac into more cost-sensitive market segments. For schools, this provides a very cost-effective solution which can be deployed to meet the growing throughput demand from on-campus wireless devices. Hotels can more easily offer a richer WiFi experience where availability of high-quality wireless services is often the primary criterion — above other amenities — for making reservations. Providing high-speed, high-capacity wireless LAN services for the small and medium business is now more attainable with the AP822. The AP822 access point allows administrators to prioritize applications to improve the user experience based on Fortinet’s unique ability to associate specific applications with deployed channel layers. For schools, this means Learning Management System applications can be assigned to one dedicated channel layer, while online classroom video feeds can be dedicated to another channel layer. For healthcare, life-critical applications such as patient monitoring can be assigned to one channel layer, doctor and nursing applications can be assigned to a second layer, and patient applications can be placed on a third channel layer. Fortinet’s single-channel option uniquely allows the AP822 to support wide WiFi channels in real-world deployments, effectively doubling the data rate over 802.11n and dramatically increasing throughput for Fortinet customers. The AP822 also provides unique roaming support. Fortinet’s patented Air Traffic Control® technology enables the network to control client roams, resulting in the industry’s lowest roaming latency figures — a true zero-handoff. Four integrated and external single-band omnidirectional antennas for 2x2 MIMO with maximum antenna gain of 3.3 dBi in 2.4 GHz and 6 dBi in 5 GHz. Internal antennas on the 822i are optimized for vertical wall-mounted orientation of the AP. Spare: Pole and Wall Mount Brackets and Hardware for OAP832e. This mounting kit ships by default with the OAP832e.